Von Forell acknowledges that you demand the very best from your next puppy. Understandably we also know that there are multiple concerns when attempting to make the correct choice as to which puppy is the right one. One of the difficulties you may find when searching for that very special puppy is navigating your way through all the clutter and how to choose the right puppy that suits you. What character traits should I be looking for ? How do I know this puppy is the right one for me? Here at Von Forell you don’t ever need to be concerned: Our selection policy is based on compatibility and not on first to order basis. 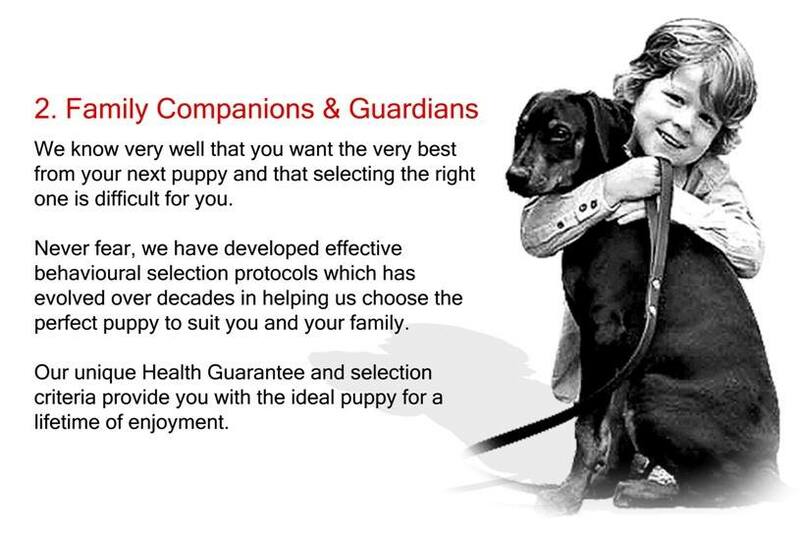 Our Family Companions and Guardians are for the discerning family that requires exceptional family oriented dogs. We would be grateful if you would complete this short profile – About You in order to help us establish how to best help you. One of our consultants will be in contact shortly, in the meantime should you prefer to speak to us personally please feel free to call. Alternatively you may download our Order form. This enables us to ensure you receive a puppy from the most appropriate litter and then the most suitable puppy within the litter.